Chaos Ensues: Why Ubuntu 12.04 is the best desktop experience the free software community has to offer. Unity, love it or hate it, it's here to stay. 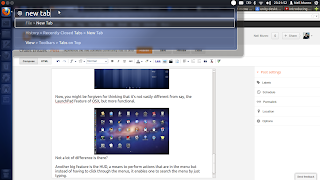 I recently gave it a try and had to just stick with it and in this following blog post, I'm going to argue why Ubuntu 12.04 is the best desktop experience that the floss community has to offer! So what's so significant about it? Well it's not just about flashy graphics, this release is a long term support release, this means that 12.04 is supported longer than the usual 18 months and not just any LTS release, this LTS release is supported for 5 years. Let's let that sink in a little bit, 5 years, that's a lot of faith in a product. One that comes with an interface that, let's face it has had a lot of bad press over this last year and that's something to bear in mind, it's only been a year! 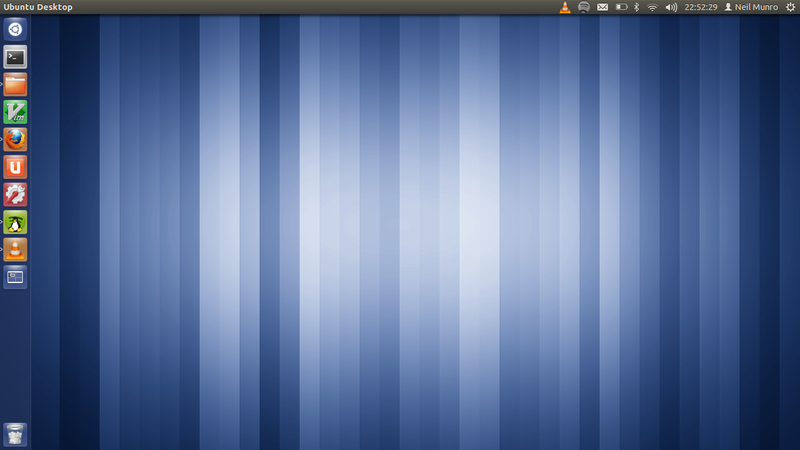 What really makes Ubuntu 12.04 stand out is how very different it feels to the usual Gnome/KDE/XFCE interfaces. Now each interface appeals to a certain user, this is why such choice exists in our community, but Ubuntu is positioning itself as a direct competitor to Windows and Mac in the desktop space, both of which have been revolutionizing their interpretation of the next generation of graphical interfaces. This is the important thing to take note of, Unity is a next generation interfaces. With the recent exception of Windows 8, the Microsoft operating system has largely had the same basic interface since 1995, seventeen years of the same graphical interface metaphor. Which is all a graphical interface is, a metaphor for a desktop. Desks with their files, folders and staplers etc. Since starting a career in computing most of that "desk work" is done on my digital desktop and while one could agree the metaphor of files and folders is still useful and helps visualise an electronic based task by using familiar real world concepts, the whole thing starts to break down when you need to stitch two PDF files together. The point is that in the early days a graphical interface imitated the real world. That way new users would have common conceptual reference points, however with computers so ubiquitous in our day to day lives the metaphor doesn't seem quite as useful as it once was. This is were Canonical have it right, we should start fresh, study how users use their computers these days and develop an interface based around how we interact with the digital. To that end they have done some user testing (here, here and here) and used that as a means to develop and improve their home grown Unity interface. Here's where I really commend them, they developed a vision and were uncompromising in their realization of that vision. Sometimes you just gotta knuckle down and take a few beatings for sticking with your visions. Apple have been deciding what they think is the right interface for years now and it's worked for them to the point of being viewed as a leader in the Interface world. So if following an unorthodox (at least in the open source world) methodology will ultimately result in a great open source user interface then I certainly have no problem with them adopting a more rigid development method. I also take care to remember that I have not paid a since penny on this OS and that I am not entitled to anything except what I am given. Anyway lets look at Unity. If you have not used Unity before it's a bit different, one can see where the various inspirations came from, it has a menubar at the top of the screen (a la mac), a dock/launcher to the left of the screen, which is the go to location for application management and a rather good looking overlay which allows you to search, run and manage your installed applications and documents. Immediately visible along the left of the screen is a dock type application, there's arrows which indicate which applications are open, an arrow on the left of the icon indicates the application is open, an icon on the right indicates that the application is focused. These are tiny little additions that contribute to a fantastic user interface. You can see several things here, in the top left you have the window controls, in all full screen applications the window controls are always located there. At the bottom there are five icons, these are known as lenses they one to filter results, additionally there's a means to further refine your search results. Now, you might be forgiven for thinking that it's not vastly different from say, the LaunchPad feature of OSX, but more functional. Not a lot of difference is there? Another big feature is the HUD, a means to perform actions that are in the menu but instead of having to click through the menus, it enables one to search the menu by just typing, like so. As I'm sure you can see this is something of a break in the desktop metaphor, it seems to be driven towards the concept of text input. For years I have been seeing various users using various bits of software for quick launching things based on entering a search string. Even care has gone into the preference settings, it's a fantastically complete solution, which again allows you to search inside the preferences. It's not just the graphics though, Ubuntu 12.04 comes with it's own cloud based file sync application (Ubuntu One) that's also available on your phone so you can use Canonical's offering over all your devices. 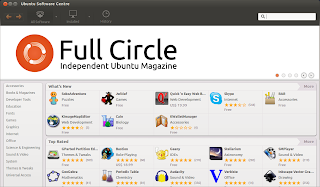 Finally the variety of free and paid for applications available in the Ubuntu Software Store is fantastic, I was expecting almost no paid for applications, but almost every search produced some premium results, which was encouraging. This is stuff both Windows and Mac are pushing hard towards and why should we do something different simply because it's what someone else is doing, arguing that one shouldn't do something similar that's popular sounds very much like not invented here to me. A gret 'feature' is that the interface in all it's advanced graphical glory, can be operated entirely without the mouse, something that a short cut junkie can really appreciate, but by the same token one can still do everything using the mouse, should they choose to. 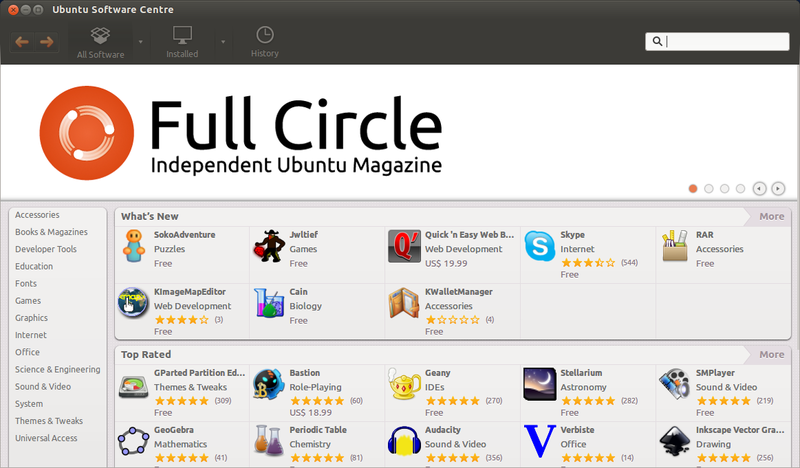 What it boils down to is the fact that Ubuntu isn't just about the interface (which is frankly stunning) it's a complete end to end solution, with an apps store, cloud integration and excellent preferences management all wrapped in a simple yet powerful next generation graphical interface. And it's only going to get better. EDIT: I also forgot to mention that there's also a back up and restore method that allows you to perform incremental backups, this is in the style of Apple TimeMachine and again it's integrated into a central preferences application. There's also the Ubuntu font face, now, I don't think creating one's own type face was strictly necessary, but it looks very good and does create a unique brand, much like Mac had Monaco for years as the default font. There's merit to it, and the mono space variant is great for programming in Vim! All these little things add up to create a very polished, functional unique branded desktop experience. Great, someone who gets it! I reverted to a gnome 2 desktop on a Debian install on a old system , it was so archaic and clunky to use, its so easy now to hit Super Key and type the first few letters of the app i want to open rather than looking through the nested menus of the old days. Unity is much better thought out than Gnome 3 (not trying to start a flame war) and much easier to use than KDE (if anything KDE has far to much going on and every KDE app has too much configuration IMO. archaic and clunky? Do you know "Alt+F2" thing? This is a very positive review of Unity. It is very tempting for me to go and have another look. I have a Ubuntu 12 download prepared and waiting. I just haven't taken the step yet to give it a go. I think I just might do that now. The one thing everyone seems to ignore is the lack of customization. 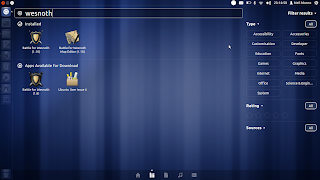 Gnome is virtually unable to be customized unless you have a 3rd party tool. I am not excited for unity as it is just like Mac almost entirely locked down. 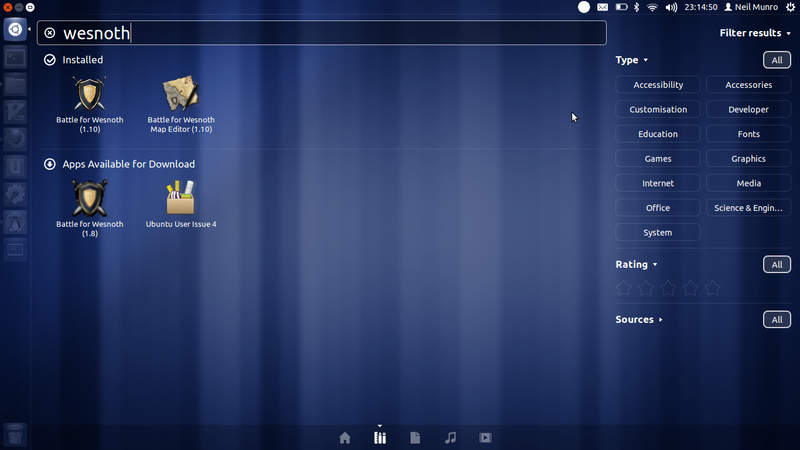 Once it is as customizable as gnome 2 I will be happy. I didn't ignore it, I addressed it, see my paragraph that begins "Here's where I really commend them". 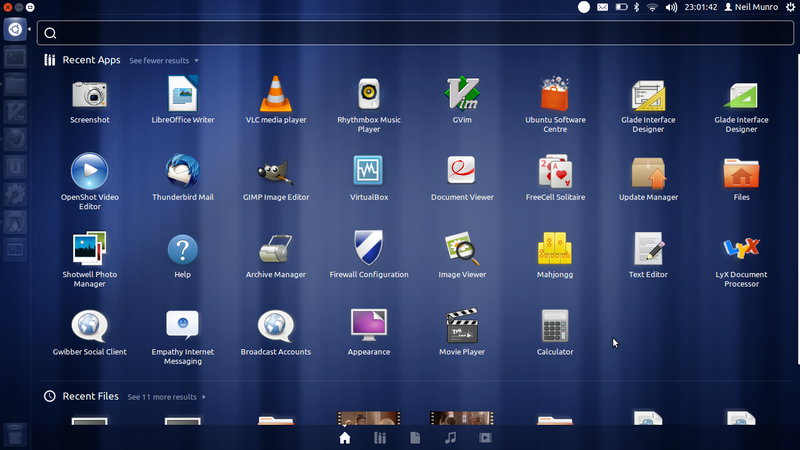 I think that the reason that Ubuntu is so good is because there's limitations. It's unusual for a free software desktop to be so locked down, but by the same token there's also fewer things to go wrong. One should also note that Windows isn't that customizable either and here's the thing, Unity isn't trying to do what Gnome or KDE does it's trying to compete against Mac and Windows, as such we must ensure we compare it to it's peers. This article talks at length about Unity but I did cover other aspects of Ubuntu, since it's Ubuntu as a whole I was reviewing, not Unity itself. One can't compare Ubuntu to KDE or Gnome, as they are just desktops, not operating systems. 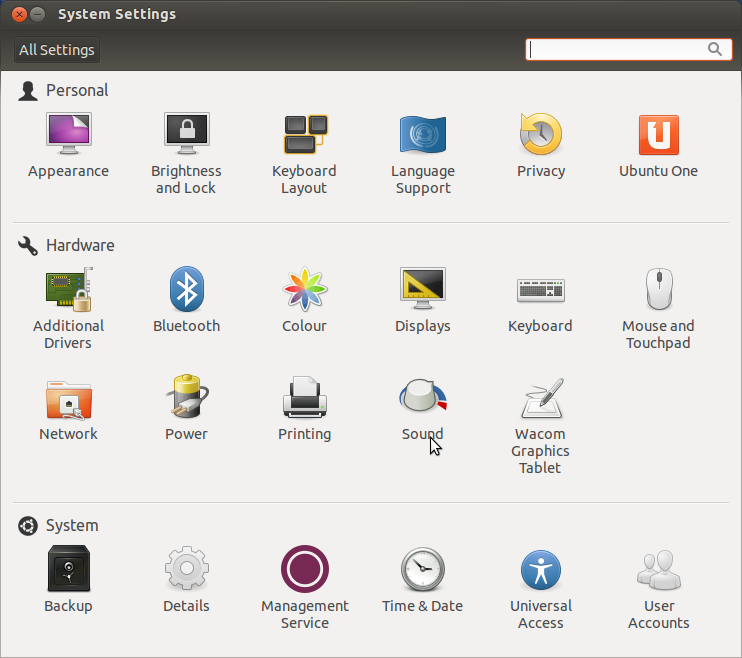 Canonical has built a software ecosystem around Ubuntu, with that in mind, and given the fact Canonical are trying to compete with Windows and Mac, one ought to compare Ubuntu to Win7 or OSX, not Unity against Gnome. Very well thought out. I tried first 12.10 and found it to be so unstable on my PC that I had no choice but to load another OS. Which brought me down to 12.04. Better, but in my opinion, not by much. Random app crashes was high on my annoyance list. Also for some reason Gwibber and Empathy just didn't want to work right meaning certain clients wouldn't connect. Also the Unity bar had confusing behavior at first. A quick glance over to the left did not let me know if I had certain apps open. Yes I know there's little triangles over apps but it's not intuitive to me. Overall Unity seemed very bogged down and slow. Felt like it wanted to go and do things immediately but just couldn't. I would compare it to a shiny new expensive sports car that was trying to carry the load of a half ton pickup. Last when an app would crash it would only indicate it half the time by darkening the said window. But... it did that also if an was working and just was taking to long. Confusing. Let me end by saying I've been using Linux since the late 90's all the way from Red Hat to Mandrake (yes Man-DRAKE for those who remember) to Ubuntu. I'm also a network admin (Windows/Linux)by trade and full time PC hobbyist. With that being said I feel I'm definitely not the beginner or average user and don't mind the command line. BUT wile I find a lot to like about Ubuntu and their current vision for the platform, I just feel like Unity falls short and is a turn off.